I hate to be one of those philistines who can’t appreciate the literature of a past age, but I have to say – the art of the crime novel has improved immensely since 1909, when The Iron Chariot was published. Author Stein Riverton (real name Svein Elvetun) apparently gets credit for being the inventor of the Scandinavian crime genre. And The Iron Chariot is his classic work. But even for a Norway booster like me, it’s a slog, my brothers. A genuine slog. The story opens on a summer day at a resort on a Norwegian island. Some locals come running, announcing they’ve discovered a body. A few guests who’ve been lounging on the lawn run to look, among them the narrator (who is never named). A local gamekeeper has been clubbed to death. Shortly a private detective is summoned from Kristiania (now Oslo). This detective sets about questioning a few people, relaxing in his room, and wandering the area, apparently without purpose. He carries on a series of languid conversations with the narrator. And about a hundred years later, he names the killer. “Stein Riverton” is reported to have been a fan of Nobel Prize-winning author Knut Hamsun. This is not good news for the casual reader. The book is indeed Hamsun-esque, and that means slow progress and dense prose. I also didn’t like the detective, Asbjørn Krag, who is one of those inexorable, infallible thinking machines who infest so many early mystery stories. Worst of all, I figured out the culprit’s identity very early on. After that, it was a matter of mumbling, “Get on with it! Get on with it!” for a hundred pages or more. 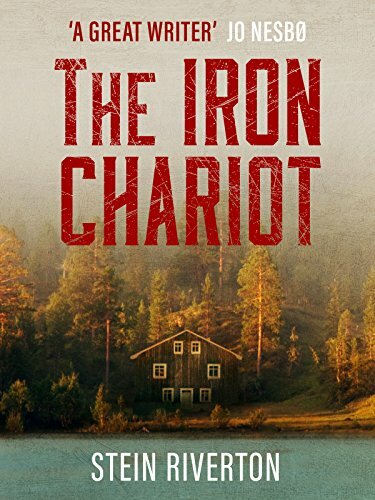 Valuable for its historical significance, The Iron Chariot is a yawner of a book. I recommend it only for devotees of old mysteries. Previous Post‘Faithless,’ by Kjell Ola DahlNext PostWho’s the most literate? Depends on how you look at it.